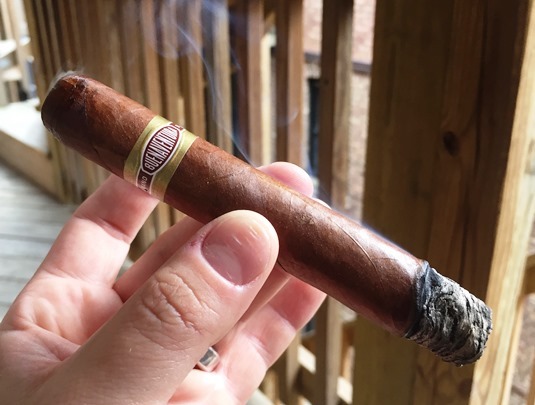 For years, my colleague has praised the Buenaventura line by Curivari as not only an excellent smoke, but an excellent value. The cigars—which sport a classic, Cubanesque presentation and have been well-reviewed at StogieGuys.com on numerous occasions—retail for about $5 each. That’s a very refreshing price point in today’s market. Curivari has also adopted the consumer-friendly practice of selling its Buenaventura cigars in ten-count boxes. This is, as far as I’m concerned, a policy more cigar makers should seriously consider. It makes the commitment to buy a box (both financially and simply as a matter of confidence you’ll enjoy it) much easier. The BV 500 (5.25 x 50) is one of three original Buenaventura vitolas released in 2012—the others being BV 560 (5 x 60) and BV 600 (6 x 60). Since, Curivari has expanded the line with new formats, including D7 (5.5 x 52), Mini BV (3.5 x 50), Petit BV (4.25 x 54), and Picadores 52 (6 x 52). All are Nicaraguan puros. I picked up three BV 500s at my local tobacconist for $4.90 apiece (not including taxes). If, like me, you’re a fan of the old school Cuban presentation, you’ll love the way this cigar looks dressed in its simple, understated band. The Nicaraguan wrapper is clean, smooth, and incredibly oily, though don’t be surprised if you encounter a harmless watermark or two. The slight box press gives the spongy cigar an oval shape. Pre-light, I find only the faintest notes of sweet hay and honey at the foot. The expertly applied cap clips cleanly to reveal a smooth cold draw. After setting an even light, I find a medium-bodied profile of cedar, rye, cashew, caramel, and a bit of sweet cream. The texture is bready. The finish has black pepper, cereals, and some leather. As it progresses toward the midway point and beyond, the flavor can best be characterized as a core of dry wood and toasty bread with background notes ranging from milk chocolate and dried fruit to syrup and cherry. The final third is much the same and, thankfully, the tasty, well-balanced smoke stays cool throughout. Construction is impeccable, especially for a sub-$5 cigar. All three of my samples exhibited set-it-and-forget-it burns, solid ashes, clear draws, and bountiful smoke production. Notably, I find the sharp black mascara of the burn line to be quite beautiful set against the oily wrapper. There’s a lot to love from the Buenaventura BV 500. Great flavors, classic presentation, affordability, solid combustion properties. It may not be the most complex cigar on the market, but it’s surely one of the best values. For that, I award this Curivari creation a score of four stogies out of five.